The largest cities need to focus on pollution reduction to better the environment and reduce health risks for their citizens. Some of the main actions are of course to reduce number of cars by impacting traffic regulations, improve public transport and to facilitate cycling, but there will still be people travelling by car, although the number of drivers doing so should be kept to a minimum. Up to 30% of all driving in some city areas are basically just people trying to find somewhere to park. For us it is clear, there is room for improvement and we have some solutions for that. We have a lot of solutions in our portfolio that reduce pollution in cities. 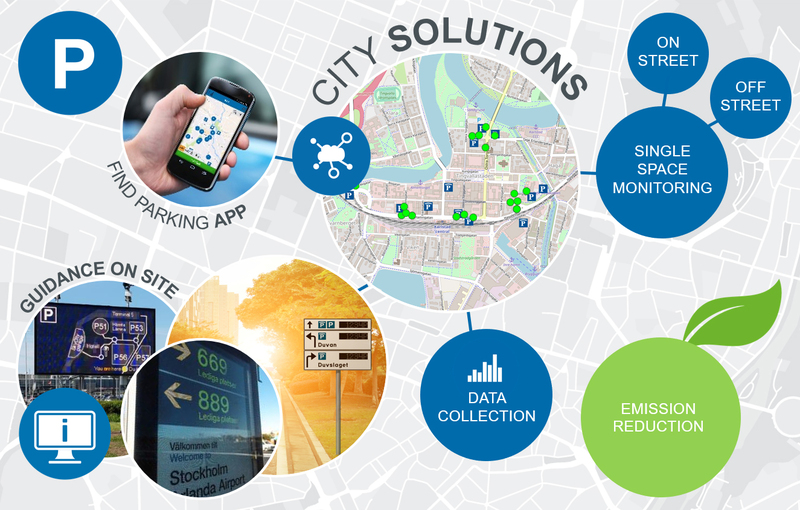 Systems to regulate traffic, improve public transport, facilitate for commuters and more, but in this article, we will focus on solutions for guiding drivers and cars faster to their destination – with improved parking guidance. Reduce driving around by making it possible to reserve a parking spot. Then the visitors will know if they have available parking or not, before they arrive. This will lead them straight to the parking area with no need to drive around unnecessarily which leads to less stress and less pollution. If booking is not an option, the driver can check for number of available parking spots on our app, before they leave home or are on their way. The status from the parking areas are live so they always know where there would be the best possibility to find somewhere to park close to their destination. There might also be possibilities to get the information directly into the cars displays in the future. Not everyone book in advance or have even thought of downloading the app or have access to the data elsewhere, but they still need somewhere to park. Let them find parking faster too, showing them the number of available parking spots on signs along the road. With city guidance, signs are placed close to strategic intersections, to show the drivers if it is even worth driving towards the preferred parking area or not. This will save them from taking the extra tour, driving in frustration towards and back from a full parking area trying the next one instead. Of course, many drivers have a high motivation to come as close to their destination as possible and are still motivated to drive around in the nearest parking area until somebody finally leaves, but some are not. Let this be up to the driver. What cities, municipalities, real estate owners, large companies and operators can do, is to make sure they have a choice to reduce pollution and stress, by giving them the opportunity to choose, by making the necessary information available to them through parking guidance.